Professional choice for many years. Deluxe model is 1 inch foam padded. 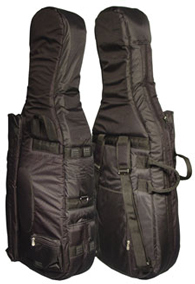 Lots of handles, pockets, and shoulder strap included. One Year warranty. Made in US. Custom bags available in the DeLuxe model for a small price premium. Lighter padding, yet still very protective. A great overall value, and a top choice for many years. Black canvas exterior with backpack straps, multiple handles. Good overall value. Made in China. One Year warranty. 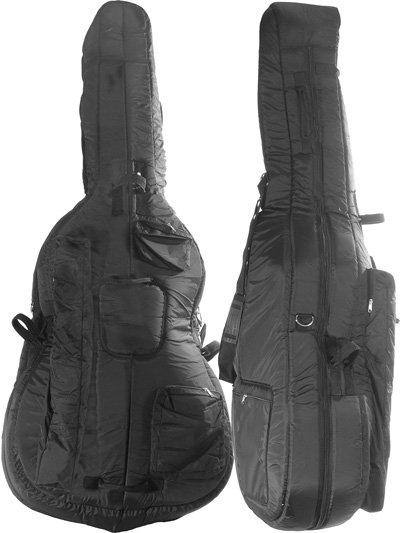 Cello bag model pictured here. 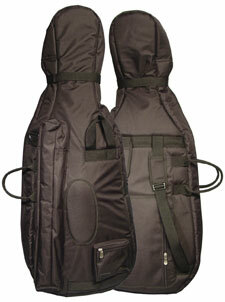 Black canvas exterior with backpack straps, multiple handles. Made in China. One Year warranty. 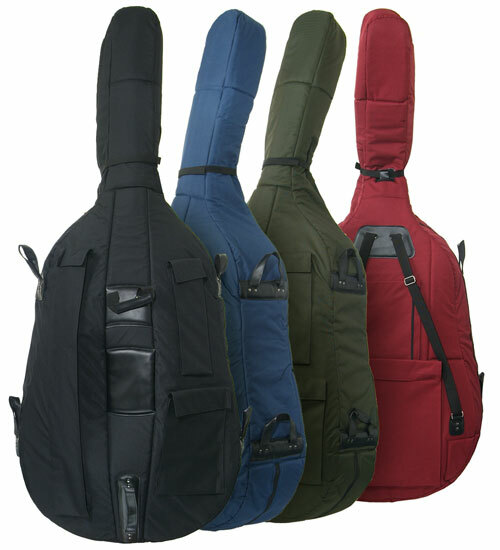 Cello bag model pictured here. 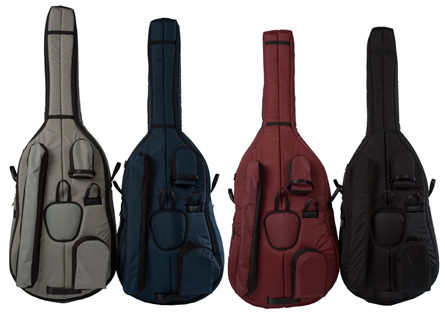 New DeLuxe padded model competes with professional grade bass bags from other brands, but costs much less. Backpack straps. Music pocket. Many handles and accessory pockets. German made flight cases. 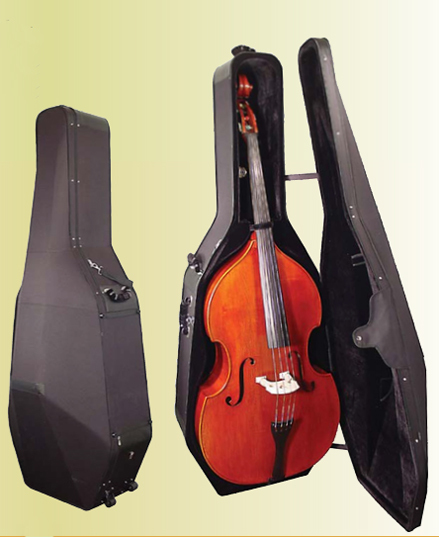 Fiberglass synthetic resin shell bass case with swivel wheels. White exterior with red velour interior. Accessory compartment and bow pockets in adjustable interior. Instrument suspension system, and SPS Side Protection System. Made in Germany, Swiss latches. Weighs 55 lbs. Touring professional's choice. Built for years of heavy duty use. Shipping cost on this item will be custom quoted depending on your location. 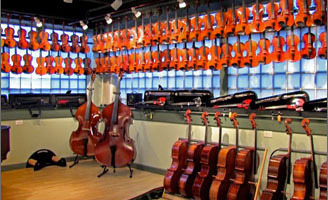 Provide dimensions of your instrument with order. Affordable, nicely appointed case with high-density polyfoam shell. Zipper closure, cordura exterior with large music pocket. Padded velour interior with two bowholders and accessory pocket. Black exterior, blue interior. 26.5 pounds. Shipping charges for this item will have to be quoted, based on your location. 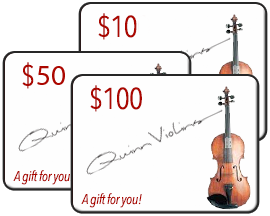 Contact us by email for details. 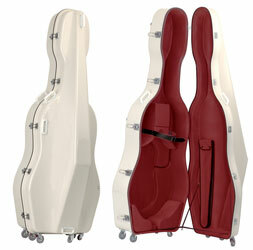 Foam and wood shell bass case with wheels, and lots of handles! Wheels are mounted on the side of the case for easy passage through narrow aisles. German hardware. Black exterior with black interior. Two bowholders. 31 pounds. Shipping charges for this item will have to be quoted, based on your location. Please contact us by email for more information. 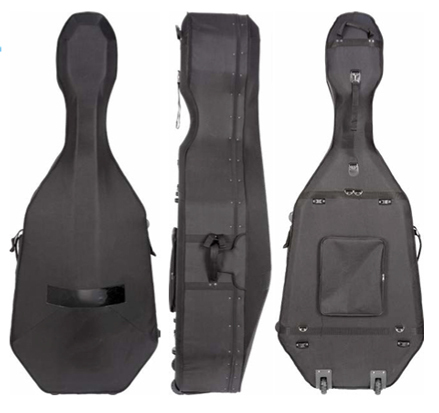 Finally, a bass case that is truly mobile (7 inline wheels allow for easy transport), with adjustable padding to fit a variety of basses. 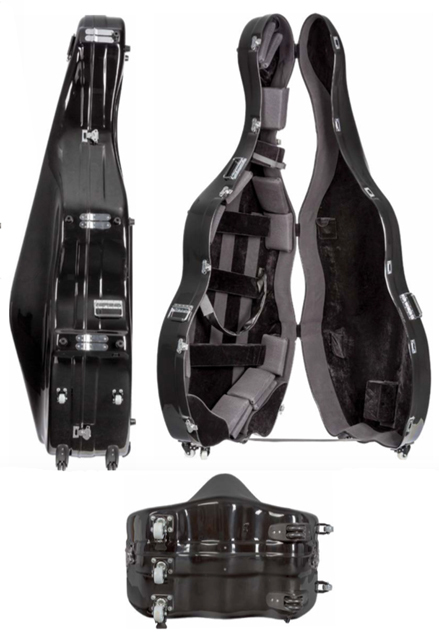 This case has lots of handles, and a plush suspension interior with neck strap and padded body straps to keep the bass in place - safe and secure! Also features two bowholders and an accessory pocket. 3/4 only. Weight 52.0 lbs. Black only. Shipping charges for this item will have to be quoted, based on your location. Please contact us by email for more information.